Free Your Friends by Matching and Popping All the Bubbles You See. An evil wizard has trapped all the children of the forest within magic bubbles! The only way these vile suds can be popped is if a matching bubble is hurled at them with great force. Gather your wits and muster all the strength you can; you’ll need both if you want to undo this curse once and for all in Bubble Mania. Throw bubbles at the mass above you, match similarly-colored ones together, and watch them all burst in a flash. 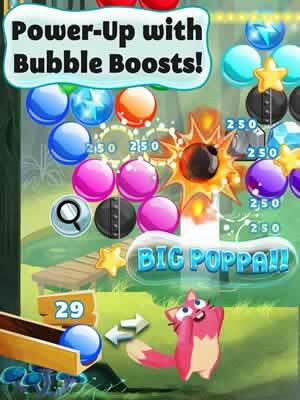 Can you save your little animal friends, destroy all the suds there are, and stop the wicked bubble wizard? Load up Bubble Mania and find out! Bubble Mania isn’t a hard game to get into at all. Just match similarly-colored bubbles together and watch them pop. However, that simplicity belies a challenge that will rapidly grow more intense and cerebral the further on you go. The bubble wizard is cunning, so keep your wits about you. Complete over 100 challenging levels. Burst dozens of bubbles at once with one good throw. Calculate the trajectory of your throws for best results. Throw your bubbles carefully; you only have a limited number to toss. Bounce bubbles off the walls to pull off the trickiest shots ever thought possible. Rescue all the trapped babies to complete each challenging level. Part of the challenge behind Bubble Mania is that not all bubbles are created equal. While most of them are perfectly ordinary, others contain special properties that make them potentially more difficult or strategic to pop. Keep an eye out for them. Black bubbles can’t be burst normally. You’ll have to pop those adjacent to them first before drop them on the ground. Avoid popping poisonous bubbles if you can, or else you’ll lose your precious shots. Pop lightning bubbles to zap all bubbles in the row at once. Burst the plus bubbles to add more shots to your arsenal. If you ever get stuck with one notorious group of suds and your usual skills just aren’t cutting it, then consider using any number of Bubble Mania’s amazing power-ups. Bring along anti-toxin to resist the effects of poisonous bubbles. Get a hold of some Rainbow Bubbles that can be matched with bubbles of any color. Use Bomb Bubbles to destroy any bubble on the screen, including those that can’t burst under normal conditions. Activate the Long Aiming Line to get an accurate depiction of your throw’s trajectory. Use this to pull off incredibly tricky shots or to improve your aim in general. 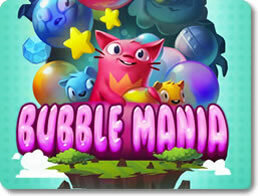 Bubble Mania is a challenging and positively addictive puzzle game that will keep you coming back for more. The rules are simple, the gameplay is easy to grasp, and the controls are snappy enough that anyone can pick it up and play right away. At the same time, the challenge constantly ratchets up to ensure you get more creative with your bubble matching skills. 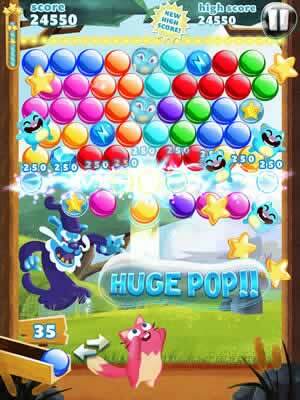 Download and play Bubble Mania for free and burst the evil wizard’s bubble once and for all!